A Rockingham County Community Foundation (RCCF) grantee has launched a new app to promote public health in the area through a grant funded by the Dan River Basin Grant Program through Duke Energy. 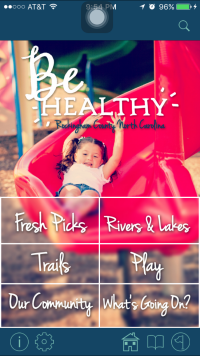 The Be Healthy App, a project of the Rockingham County Division of Public Health, allows residents to access information on local physical activity opportunities and nutrition. Regional Director Dawn Neighbors recently conducted a site visit at the Rockingham County Department of Health & Human Services, where she learned that the free app is available in the App store and Google play. Beverly Scurry, coordinator of the Rockingham County Healthy Carolinians Partnership, announced the release of this app on March 20. 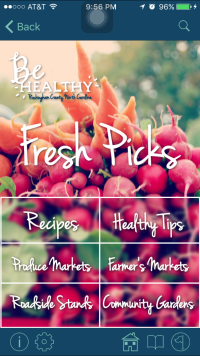 The app provides an easy way for residents and visitors to the area to find healthy and fun options such as local roadside stands, community gardens, biking trails, kayak and boating launches, community parks, recreation departments and sporting events, as well as suggested recipes for a variety of dietary needs. The same information can be accessed through the affiliated website. App users can easily locate specific trails or events with just a few clicks. For example, clicking on “Trails” provides a list of local options and the distance from where the app is being used. Clicking on any of the trails from that page, will open a more detailed page with trail description, location, hours, contact information, website and routing options. If several trails are located nearby, a flag appears in the lower right corner of the screen which users may click on to see all options in their vicinity. There is even a trail listed at the Rockingham County Animal Shelter where people may go and volunteer to walk shelter dogs. To encourage app usage, online giveaways and “point system” check-ins are planned in the future with incentive prizes which will further encourage physical activity and healthy behaviors.